The circulatory system in the human body stretches 66,000 miles, more than two and a half times the circumference of the Earth. The heart beats 2.5 billion times during the life of a 75-year-old. 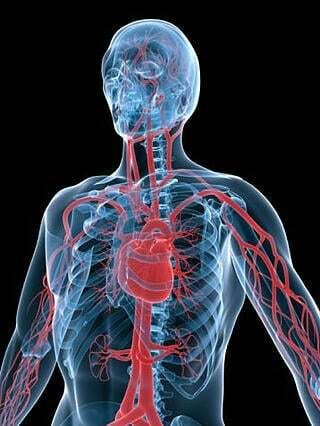 The heart expels 2 ounces of blood with each beat, five quarts of blood each minute, 220 million quarts in 70 years. Human blood retains a link to ancient Cambrian seas; the same balance of salts and minerals that existed in the primitive oceans half a billion years ago is present in blood. Blood is a liquid tissue: fluid makes up more than half; plasma, white and red blood cells make up the remainder. Red blood cells (erythrocytes) are the body’s cellular lungs; their job is to ferry oxygen to every cell and remove carbon dioxide. If the red blood cells from one person were to be stacked in the sky, they would reach 31,000 miles. Each red blood cell has 270,000,000 hemoglobin molecules; each hemoglobin molecule can carry four oxygen molecules. The hemoglobin in red blood cells scoops up oxygen molecules in oxygen-rich tissues such as the lungs, and then releases them in oxygen-deprived tissues throughout the body. Each second we lose about 3 million red blood cells only to be replaced by the same number produced in the bone marrow. Venous blood that delivers carbon dioxide back to the lungs makes up 75 percent of blood flow at any given moment. Blood flow measurement is vital because it provides a window into the delivery of oxygen and nutrients to body organs and cells. Source: The Incredible Machine (1992), National Geographic Society, Washington, D.C.